"Ingenium’s Collections Conservation Centre: Bringing Canada’s Past into the Future" was originally published in Muse Magazine — March/April 2019, a publication of the Canadian Museums Association. There’s a locomotive in Ottawa that has some amazing stories to tell. If trains could talk, the CP 1201 might enthrall you with the story of its construction in Montreal in 1944, and how it symbolized the end of the steam era in the Angus Shops of the Canadian Pacific Railway (CPR). A workhorse during and after the Second World War, the locomotive could recount how it moved goods, services, and people across the country, including young soldiers returning home. In its second life — after its donation to the Canada Science and Technology Museum in 1968 — the CP 1201 served as a national ambassador for the museum, most notably when it journeyed to Craigellachie, British Columbia for the centennial commemoration of the Last Spike in 1985. After being acquired by the Canada Science and Technology Museum in 1968, the CP 1201 offered rides to visitors before being retired to storage; it will have a place of honour in the new Collections Conservation Centre. Right now, the CP 1201 doesn’t have the chance to tell its stories — but it soon will. Weighing in at 185 tonnes, it’s the largest of approximately 85,000 3D artefacts and two million 2D artefacts that are embarking on a monumental move to a new home – the Collections Conservation Centre for Ingenium, Canada’s Museums of Science and Technology. Currently under construction, the Collections Conservation Centre is a 36,000 m² facility designed to protect and showcase Canada’s national science and technology collection. 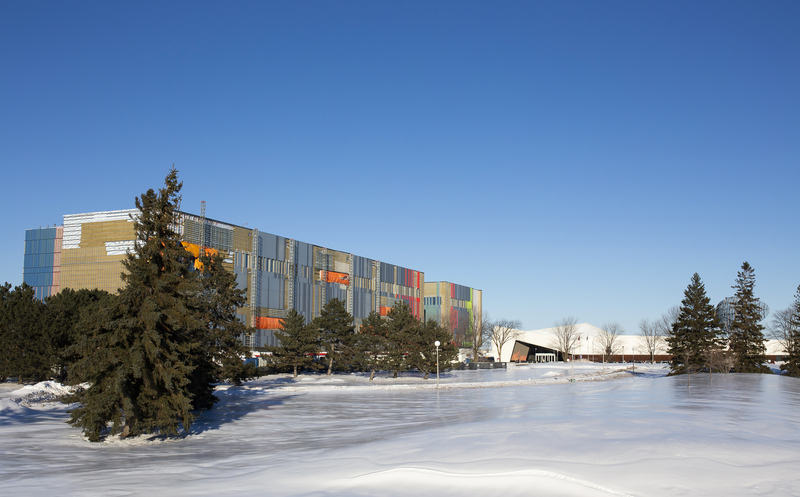 On the building’s modern exterior, three prominent, coloured fins — green, blue, and red — are symbolic of Ingenium’s three national institutions: the Canada Agriculture and Food Museum, the Canada Aviation and Space Museum, and the Canada Science and Technology Museum. But the Collections Conservation Centre represents far more than just three museums; this building is the physical manifestation of Ingenium’s vision for the future. From its state-of-the-art design to a shift in corporate attitude that will open up virtually every space to the public, the Collections Conservation Centre intends to make its artefacts, facilities, and expert staff more accessible than ever before. One of the unique spaces within the Collections Conservation Centre will be the Ingenium Research Institute, which will provide the facilities for collaborative and individual projects related to the collection. Encompassing digital and media labs, the Ingenium Research Institute will offer space for staff to come together with academic and industry partners. There will also be a special collection and artefact examination room. A special collection and artifact examination room within the Ingenium Research Institute will offer an intimate, hands-on space for researchers to engage with objects. Another key feature of the building’s design is the Digital Innovation Lab, which will take Ingenium’s collection beyond the physical walls of the Collections Conservation Centre. This lab will enable users to develop new approaches in digitization, 3D modeling, visualizations, games and game engines, and augmented, virtual, and mixed-reality applications. Possible initiatives like an artist-in-residence program would support creative linkages across a wide variety of STEAM-linked projects. Space will also be carved out for open-concept employee work stations and several conservation labs. A modern library and archives — open to the public — will offer a rich array of rare books and other resources, ideal for users researching the history of science, technology, agriculture, food, aviation, and space in Canada. Beyond Ottawa, Ingenium’s Digital Archives now offer a whole new level of access to digital copies of archival holdings to users worldwide. The elevator in the Collections Conservation Centre will carry artifacts as large as 6.5 m long, 3.2 m wide, and weighing up to 13,600 kg. Scheduled for completion later this year, the four-storey Collections Conservation Centre was carefully designed to be as energy efficient as possible. Photovoltaic windows, made in Spain, will not only produce energy to power portions of the building, but will also reduce the heat gain in the building. A section of approximately 6,000 m² of solar arrays on the roof will also help power the facility. Inside, mobile compact storage solutions will optimize the available space, and tall ceilings will allow for maximum vertical storage. And when the hundreds of thousands of nationally-significant artefacts are finally in place, the public will enjoy unprecedented access to them. Ingenium plans to offer guided tours of the Collections Conservation Centre. There will also be an option to make an appointment with collection and research staff to see the objects. But first, Perrault must turn his attention to the highly-complex task of packing Ingenium’s artefacts, currently stored across three warehouses in proximity to the Canada Science and Technology Museum. The relocation represents a multi-year undertaking that involves all aspects of managing the collection, as well as the expertise of numerous curators, conservators, and artefact handling experts. From medical equipment and vintage cars to a cutting-edge magnetized target fusion device, these objects —emblematic of Canadian ingenuity — must be meticulously catalogued and safely packed before moving to their new home. Among the other treasures, the CP 1201 waits patiently for its chance to move; it’s slated to take a prominent position in the “rolling stock reserve collection” in the Collections Conservation Centre. That way, when the first visitors come through the doors of the new facility, it can be viewed through a large display window, polished and ready to share its colourful stories of Canada’s history for generations to come. Interested in future collaborations with Ingenium – Canada’s Museums of Science and Innovation? Contact Christine Clouthier at cclouthier@IngeniumCanada.org. Custom storage crates for fragile ship model artifacts that greatly reduce the risk of damage while in long term storage as well as reducing handling. A series of cameras, carefully catalogued and tagged by Ingenium staff, await the move to the Collections Conservation Centre.